A journey through time charting the information power shift caused by the Internet and the ensuing development of a new global politics. Gaia, a New World Order, is born today, the 14 August 2054. Racial conflicts, ideological conflicts, religious conflicts, territorial conflicts belong to the past. Every man is a world citizen, subject to the same law. The Internet has driven the change, spreading communication, knowledge and organization at a planetary level. The Crisis of Credit Visualized from Jonathan Jarvis on Vimeo. The goal of giving form to a complex situation like the credit crisis is to quickly supply the essence of the situation to those unfamiliar and uninitiated. Update: Useful links for the global economic meltdown. A Great Recession Guide - a mini-guide to the lighter side of the current, prolonged recession. Google Tip Jar - a collection of money saving tips submitted and ranked by the web community. The site is clean and simple to use, giving you two ways to build a playlist; Standard Playlist or Smart Playlist. You can add up to 100 videos to a standard playlist and 50 to a smart playlist. To build a Standard Playlist, videos are added one at a time, simply enter the URL or Embed code from the video’s location, for example a YouTube page. You can build a Smart Playlist (YouTube only) by searching for keywords or by YouTube Username. The content in smart playlists changes dynamically as new videos are found. Select the number of videos you want to show in the playlist, and sort by Relevance, Published Date, View Count or Rating. Embedr lets you create multiple playlists. You can easily change the order of videos by dragging them into position. You can also edit various parameters before and after you create a playlist. This is ideal for building a pool of content associated with your user profile. Once you’ve created a playlist you have a ready made widget that you can customize and embed on webpages. The width of the widget determines it’s height proportionately. It’s simple and very effective, making it a breeze to create and distribute video content in an attractive and functional format. A mashup by Totom of Smashing Pumkins and Mulholland Dr by David Lynch - Video by Titus Prime for the Mashed in Plastic project. 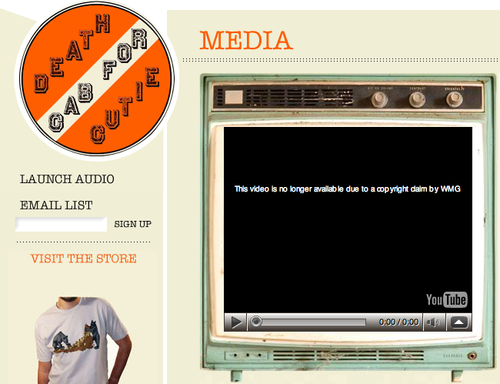 Version 1 has a shorter intro and different video cuts than Version 2 shown on the Mashed in Plastic site. Here’s the YouTube Video Playlist for Mashed in Plastic - The David Lynch mashup album. Weapons of Mass iGnorance… pop eats itself to death … when everything is false, nothing is permitted… meet the new bo$$, same as the old bo$$… the world is(n’t) watching… or listening. TARDIS: Back in time - What if The Beatles had used Creative Commons Licenses? A new book by author Steve Knopper (Rolling Stone, Wired, Esquire) chronicles the record industry’s relentless rise to riches during the CD era to its dramatic demise in the post Napster digital age - Appetite for Self-Destruction: The Spectacular Crash of the Record Industry in the Digital Age. …No, but you can snort cocaine. No doubt the excesses of the music industry played some small part in its downfall and yes, the times they are a-changin’. Regarding the Music Industry, I refer you to the Einstein quote in the post prior to this one. A radical new project designed to punish and reform illegal downloaders of copyrighted music could prove to be a huge money spinner for tech savvy investors. The Pirates Prisons Project aims to capitalize on the current copyright crunch by building 100s of 1000s of new prisons to house the unlimited supply of illegal internet users. If proposed legislation to criminalise billions of music fans goes ahead, the high probability of re-offending represents a once-in-a-lifetime investment opportunity to secure real financial gains for PPP shareholders. The ingenious shares scheme relies on the music industry's desire for economic dominance. However critics of doom and bust policies believe the music industry's strategy of using a failed business model is enevitably doomed to failure (See links below). Only (prison) time will tell. What if The Beatles had used Creative Commons Licenses? Artist David Gribouille using his fingers and the ‘Brushes’ app to paint on the iPod Touch. The video is running at 3-times normal speed, the work took around 17 minutes to complete. His Blog and more news about mobile art at iArtMobile.